The Cardo (or Cardo Maximus) was a paved avenue approximately 22.5 meters wide with a colonnade. It was built during the Roman Period (2nd-3rd centuries CE) and served as Jerusalem's main commercial avenue for almost 500 years. "Many Roman cities had a Cardo – a grand main thoroughfare flanked by two rows of columns, bisecting the city from north to south. 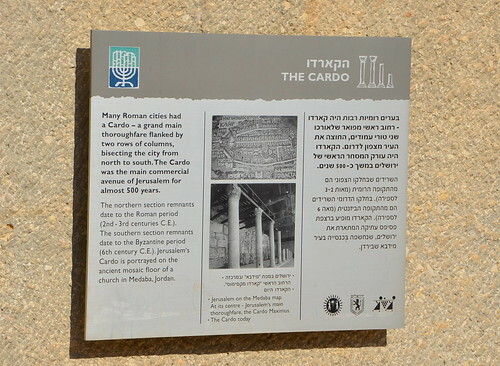 The Cardo was the main commercial avenue of Jerusalem for almost 500 years. The northern section remnants date to the Roman period (2nd - 3rd centuries C.E.). The southern section remnants date to the Byzantine period (6th century C.E.). Jerusalem's Cardo is portrayed on the ancient mosaic floor of a church in Medaba, Jordan."